This has long been and is still my favourite app, although I must say it has been annoying me a bit lately because sometimes it doesn’t accept my phrasing… in English! (often it’s phraseology is American). But to feel such hatred and annoyance and continue going back means I must have forged a strong emotional bond with it. It has a clean, well-designed interface and offers a game-like approach to language learning. You learn through repetition and by making mistakes because on each ‘level’ you have three lives and if you lose them you have to start the level again. To add to the game-like nature there is the option to follow and compete against your real-world friends. The comments and discussions within the community are an added bonus, often being very informative and interesting. The way Duolingo is monetized is also very interesting and an original way of keeping the app free for its user base. It is done by encouraging users to help translate articles, thus creating a translation service that they can charge companies to use. Outsourcing! I still haven’t completed Duolingo, but I am almost there! When I first used Busuu it was free but there comes a time when services like this have to make money. Now you have to pay membership fees to access a lot of the functionality. In fact I might have to delete this from the list actually. List fail. Unless you want to go all out and buy a French laptop (with a French keyboard) then there will undoubtedly come a time when you’ll need to type in French. That’s when Type it comes in handy. A minimal little app for adding accents to typed text. This is an Open Education Resource created by the University of Texas. Not as cleanly designed as many of the other apps on this list but useful none the less. Francais interactif is full of various types of lessons but my personal favourite is this verb conjugation practice. Test your knowledge of conjugations in all the tenses! Word of warning though / life hack: the auto-fill will remember your answers so its best to take the test using the private setting on your browser. FluentU you is a newcomer and is not fully operational on the French version just yet. However, I was given the opportunity to test the trial version and I have high hopes for this nifty little app. FluentU curates a choice selection of existing French language videos on Youtube and adds to them interactive subtitles that allow you to pause the video and learn more by simply hovering your cursor over the words. It is effective and enjoyable. Once it launches and more and more videos become available, I’m sure it will be superb. In the future they plan to monetize by offering premium content but for the time being it is completely free to use. So go ahead! You can sign up to be notified when the French version is available (should be sometime in May 2014) or get in touch if you’d like an invite to use the trial version – e-mail me or leave a comment on this post. Radio France Online has a number of services available. It is regularly updated, so, by checking back every other month you’ll be guaranteed to find a host of new activities.. The easy news is a great service for lower intermediate speakers, as are the listening comprehension tests. There are also some odd online mystery games aimed more at beginners / younger learners. Maybe a little obvious but at the end of the day it is a really useful application that is constantly improving. I wont lie, I haven’t actually listened to any other podcast. But there is a reason I haven’t listened to any of the others and that is because Coffee Break French is fantastic. There are numerous seasons that begin with the basics and get progressively more advanced. You are tought the workings behind the language so that instead of repeating phrases and vocabulary you learn to understand the backbone of the language and the rules that govern it. Couldn’t come more highly recommended. Now don’t go thinking I haven’t visited any other websites, because there are plenty out there that should maybe get honourable mentions, but really the top is the French section of About.com. Nothing can quiet compare. It covers just about everything in a concise and consistent manner. It has the full conjugations for almost any verb you could possibly think of and much more besides. 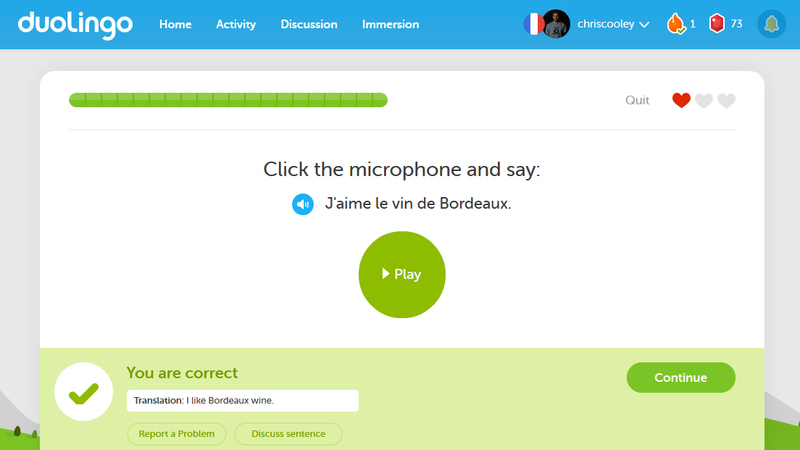 If your learning French this might as well be your homepage. I’ve put two online dictionaries on the list. The first -Word Reference- I’d say is a quicker and clearer service for single word translations. It also has great forums. …The second -Reverso- for me is better for phrasal translations. In fact it could be seen as a cross between a dictionary and Google translate. This year I’ve started e-mailing people. French pen-pals! Due to this I discovered BonPatron and I must say it is an excellent service. I type an e-mail as best I can then past it into BonPatron to see how many mistakes I’ve made. It spots spelling and grammar mistakes and gives you options for changing them if you hover your cursor over the error. Great stuff and Happy New Year. Tags: apps, duolingo, fluentu, online, resources. Bookmark the permalink. Hello. Just wanted to say how much I appreciate the info which can be provided below. use memrise, it is great for vocabulary! This information is priceless. Whenn can I find out more? I might be making a new list sometime in the future but for now I will keep updating this one as and when I come across new useful apps and website for larning French.